Google has recently announced an advanced sign-in security feature for Google Accounts called 2-step verification. 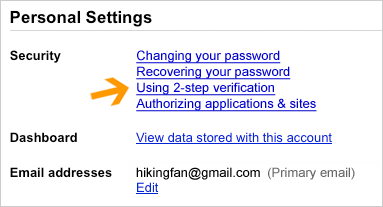 As we are already familiar with 1-step verification, which requires a username and password to sign in, now 2-step verification adds an extra layer of security to the Google account. This feature improves the security of your account. Once activated, to access your account, you need password plus extra security token. This feature is now available for all Google Accounts. 2-step verification adds an extra layer of security to your Google Account by requiring you to have access to your phone – as well as your username and password – when you sign in. This means that if someone steals or guesses your password, the potential hijacker still can’t sign in to your account because they don’t have your phone. To use the validation in two steps, you need a cell phone or a smartphone. Your device is used to pass the security token that allows you to access your account. How to Enable Two-Step Verification ? To enable validation in two steps, go into the your account settings page. You will find the new link to enable 2 step verification. Take your time to carefully set up 2-step verification using the user-friendly set-up wizard which will guide you through the process, including setting up a backup phone and creating backup codes in case you lose access to your primary phone. Anytime you can disable this authentication. So using this 2 step verification method the chances to be hacked will be avoided and also this two-step Verification is extremely useful, especially if you access your account from public computers. How to Update Kaspersky Antivirus Offline ?